Life expectancy in the United States has climbed to an all-time high over the past several years. For example, a 65-year-old man can expect to live another 17 years, while a 65-year-old woman can expect to live another 20 years. These seniors are more actively engaged in life than ever before, too. They stay employed longer, remain involved in their communities longer and take part in a variety of regular activities: from volunteer work to babysitting for family members and more. Over the past several years, there has also been a shift in the way these active seniors feel about aging in regards to remaining in their long-time homes. Older adults are choosing to move to senior living communities while they are still healthy and independent because they recognize the many benefits community living can provide to them. Senior living communities are designed with residents’ health and happiness in mind, helping them remain active physically, socially and mentally. To enjoy a campus lifestyle. Everything residents need to thrive is located conveniently on one campus. Residents can easily go from building to building for meals, social activities, healthcare and more. A continuum of care for peace of mind. Seniors can move into an independent living home and, as their health needs change, can move along the continuum of care into the assisted living community or skilled nursing center. This provides them with the peace of mind that they can remain in the same community, near their friends or spouses, even if they should need a higher level of care. Home maintenance becomes a thing of the past. In a senior living community, gone are chores like cutting the lawn, shoveling snow or clearing the gutters; all tasks that can become more difficult as seniors age. Plus, costly repairs like a new roof or furnace can really start to add up, making maintaining a home that much more expensive. Social and lifelong learning opportunities. 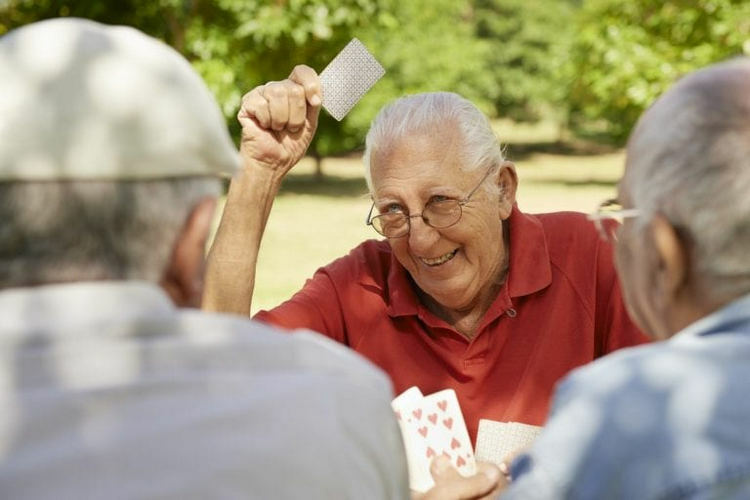 Retirement communities understand the importance of staying socially active, and there’s truly something for all residents to enjoy on a weekly basis. Plus, social activities make it easy for residents to build relationships with their peers who share similar interests. They’ll find engaging activities that also stimulate the mind, like gardening, volunteering and more. Wellness and fitness programs. Staying physically active is also vital for seniors’ health and safety. Senior living communities offer on-site wellness centers with fitness programs designed specifically for residents’ individual needs. They can enjoy working out on a variety of equipment or taking classes like tai chi and water aerobics. Delicious, daily meals. Sometimes, cooking for just one or two can become challenging, which often results in poor nutrition habits—or worse, skipping meals altogether. Today’s senior living communities offer delicious, healthy, chef-prepared meals in a restaurant-style setting; in fact, many offer a variety of dining options, from casual cafés to quiet, comfortable dining rooms. Improved family relationships. Moving to a retirement community not only improves life for seniors, but also for their loved ones who may be concerned about their future needs. Knowing aging loved ones are safe and receiving the right amount of care, exactly when they need it, provides families peace of mind. Then, spending time together becomes more about enjoying quality time than worrying about caregiving duties that may be ahead. Lower stress levels. Seniors have more time to relax and enjoy life in senior living communities. Keeping stress levels in check is a vital part of healthy aging, and residents definitely don’t need to sweat the small stuff anymore. By offering assistance with home maintenance, housekeeping, and even transportation to alleviate worries about getting behind the wheel, senior living communities strive to make life easy and enjoyable for residents. Join Peabody’s Vibrant Retirement Community! Enjoy a campus lifestyle with all the amenities at Peabody Retirement Community. We offer a complete range of residential and healthcare senior living options on 33 acres in North Manchester, Indiana. For more information about our services, please contact us today to schedule a personal tour.